Most women know that good nutrition can increase chances of becoming pregnant, but there’s another half of the fertility equation that frequently gets overlooked. 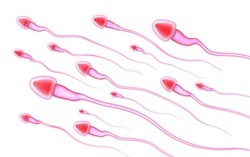 That half has to do with the male: 30 - 50% of infertility are attributed to sperm issues. Fortunately, nutrition research is finding ways to increase a man’s fertility and a new study has found benefits in one heart healthy snack in particular. The food of the hour is the walnut, one that has gained much media attention for its plethora of health benefits- especially for being one of the best plant sources of omega-3 fatty acids. Published in the Journal of Reproductive Biology, researches assigned 117 healthy male participants to either the “walnut group” which consumed 2.5 ounces of walnuts daily (a little more than a half cup), while the other half continued their regular, “Western” diets. After 12 weeks, the men who consumed walnuts had improved sperm vitality and motility as well as decreased chromosomal abnormalities. Consuming walnuts increased the men’s blood levels of alpha linolenic acid (ALA)- the type of omega 3 fat for which walnuts are best known, and which researches think plays a role in these favorable results. Omega 3 fatty acids are an important part of both men and women’s diets when it comes to overall health, which usually translates to increased fertility. ALA is just one type of omega 3 fatty acid which is found mainly in plant sources such as walnuts (2.5 mg per ounce), flax seeds (1.6 grams per two tablespoons), and avocados (1.6 grams per cup). ALA is not easily converted to the other forms of omega 3 fatty acids which include EPA (eicosapentaenoic acid), and DHA (docosahexanoic acid). These essential forms are found in fish such as salmon, tuna, herring, sardines, and anchovies. As the recent walnut study suggests, ALA helps improve quality of sperm, but other studies show that DHA is also essential to men’s fertility. In a study published in the same journal last year, lack of DHA in mice was linked to low sperm count, and when the mice’s DHA was repleted, fertility was completely restored. This may be a good reason that men who are trying to conceive and who don’t eat fish consider taking a fish oil supplement. Because the study was conducted on healthy men, not those with already pre-existing fertility problems, it is unknown if walnuts can be useful in the latter population. It is also unknown whether walnut consumption actually increases the chance of conceiving, as the study only showed that the nuts improve many aspects of sperm quality. Whether walnuts are a fertility-booster or not, they hold other male-specific health benefits. They are a good source of gamma tocepherol, a special form of vitamin E which studies have shown provide protection against heart problems in men. They are also antioxidant-rich, containing flavonoids, phenols and tannins which have been shown to decrease risk of prostate and breast cancers. Additionally, they provide four grams of protein, two grams of fiber, and a good source of magnesium and phosphorus per one ounce serving. To obtain these benefits, be sure to eat the whole nut including the flaky, sometimes waxy outer coating which is packed with the disease-fighting antioxidants. 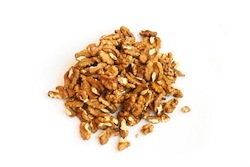 One serving of walnuts is equal to about 14 halves. This amount provides 190 calories- so be sure to stick to the serving size. Whatever your reason for eating them, it’s good to know that walnuts can boost of the odds of, well, boosting the odds!